Different graphic programs handle alpha channels differently. But have no fear FCP and deal with them. Without getting into the specifics there are 4 alpha channels settings available in FCP; None/Ignore, Straight, White, and Black. For example an image from Photoshop my contain an alpha, but you may get a not so perfect edge, so you can simply change the setting for better results. 1. 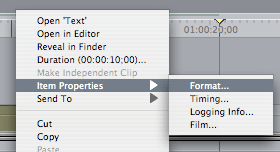 In the timeline control click or right click on the image and select item properties. From there look for the alpha column and control click or right click to change the setting. 2. In the browser look for the alpha column and control click or right click to change the setting. It’s that easy, and you are on your way to cleaner images!